You assume responsibility for a defined field of activity and are supported by a team or a department reporting to you in both factual and managerial matters. The area of responsibility generally remains constant. You are open for new developments in your area and grasp the opportunities which present themselves for optimising processes. You are THE expert in your speciality and all the companies in the group call on your expertise. You are the central defined contact partner, across the whole organisation. The high level of complexity in our process topology which we are already experiencing today means that many tasks can only be solved with an interdisciplinary approach. 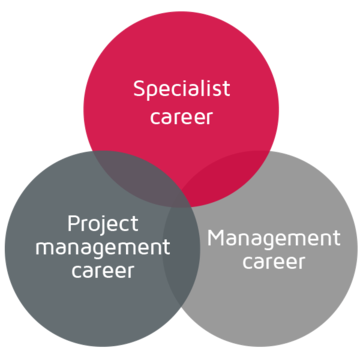 As the project manager, you assume the management of project teams made up of specialists in different areas. Of course, your personal development opportunities at POLIPOL depend on your motivation and willingness to take up new tasks and challenges. But we are aware that career plans can change. So the path once selected does not have to be a one-way street. Should you one day decide to change direction, a switch-over is possible at any time. And the most important point: Regardless of whether you hold a supervisory, project management or managerial position – the financial development opportunities are the same in all positions.